This report by Ken Adams is part of a series for CBSNews.com chronicling his run at the 2005 World Series of Poker in Las Vegas. As poker moves out of the back rooms and into the mainstream, investors involved in the mass marketing of tournament poker are trying to clean up the image of tournament poker and poker players. Few today remember the 1997 World Series final table, when ESPN televised the extraordinary comeback of Stuey "The Kid" Ungar as he captured a record third championship title. 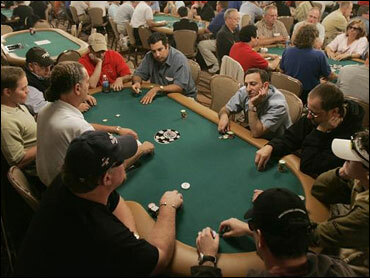 In the 1997 championship event, Ungar was second in the chip count when the final table play began. In first place was Ron Stanley, who did his best to dress up the public image of tournament poker by playing in a tuxedo. Stanley's class at the table was not enough to fend off Ungar's matchless poker talent, but he set an early standard for the kind of conduct that is increasingly required by the broadening television and Internet exposure given to tournament poker players. Throughout this year's World Series a new tournament rule was strictly enforced against players who deployed the "f-bomb" during the course of play. It made no difference whether the offending expletive was directed at another player, a dealer, the player himself, or the poker gods. Any use of the "f-word" in any form led to an immediate 10-minute penalty, during which the player's chips would be out of action except for paying the blinds and antes. No warnings. No exceptions. The zero tolerance policy was strictly enforced by the dealers (apologetically at times), as they had been warned that they could be sanctioned for failing to do so. On Internet poker sites as well, there are rules prohibiting abusive and inappropriate language in the "chat" box at the bottom of the screen where players can write messages back and forth to one another during the course of a tournament. Recently I was playing a tournament late at night on PokerStars, the leading tournament Web site. When we got down to five players I was the chip leader. The player in third chip position made a standard raise before the flop. I was in the big blind with a suited nine-seven. I called the raise, figuring that if I caught a lucky flop I had a chance to bust him. That is exactly what happened. The flop came ace-nine-seven, giving him top pair with his ace-king and giving me two pair. I bet about half the pot, and he raised all in. I called. He failed to improve, and was eliminated, two spots out of the money. In the chat box, a sarcastic message appeared from the eliminated player, telling me what an idiot I had been for calling his pre-flop raise with such a weak hand. I pointed out that when the big money went in (after the flop), I had the best hand. He responded with a curt "f*** you." I ignored him initially. But then he made a further sarcastic prediction about how I would fare if I continued to play so poorly. As often occurs with these hastily typed chat-box messages, his comments were loaded with mis-spellings and poor grammar. I dispatched a reply to the effect that "You spell about as well as you play poker." I am accustomed to hearing profanity at the poker table, especially when players lose a pot they feel they should have won, and ordinarily pay little heed. But this guy had gone beyond the pale of what I felt was acceptable or tolerable. I fired back a reply along the following lines: "I see you are a racist too. Now I am really impressed." He went away, and I turned my attention back to winning the tournament. When the tournament ended I sent an e-mail to the "support" desk at PokerStars. Ordinarily I only communicate with them when I encounter technical problems accessing or staying connected to the site. But I wanted them to be aware of conduct that I felt should not be tolerated on their site. I felt better after reporting the incident, and went to bed. I didn't really expect a response. I tend to assume that poker Web sites are nothing but a bunch of computer servers on some offshore island, staffed by a few geeks who keep the servers humming and an absentee owner who rakes in the profits. I was pleasantly surprised in the morning to find an email from PokerStars thanking me for alerting them to the incident and advising me that they had suspended the offending player's "chat" privileges. He now has to suffer silently, which is probably torture for him. I was so impressed that I sent a complimentary email to Rich Korbin, PokerStars' marketing director whom I had met at the World Series this year and the only management-level person I knew how to reach. I received replies from him and from Lee Jones, PokerStars' director of poker operations, affirming PokerStars' commitment to making their Web site a place where people can enjoy the game without being subjected to offensive or inappropriate conduct. I have always tried to live by the maxim that "if you are not part of the solution you are part of the problem." I plan to take my tuxedo to the cleaners next week so it will be ready in case I make the final table of the next televised tournament I play.